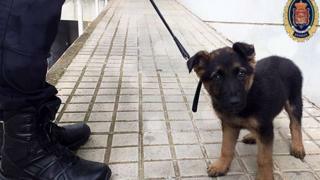 Spanish police are asking for help naming a rescued puppy that they plan to train as a new member of the force. Responding to a call, the authorities in Granada found a man kicking a German shepherd on the street. After stopping the man and rushing the dog to hospital, the officers decided to adopt and recruit the puppy. A Twitter poll is currently under way to pick a name for the newest member of the force. The officers first posted about the dog on Monday. The police rushed the pup to the hospital for treatment after stopping the "heartless" man, the tweet reads. Local media say it was the owner who was mistreating the dog. Authorities reportedly arrested him for abuse. The dog had several bruises and injuries to the stomach, according to the local press. Scans show there was no internal damage, however, and the dog has made a full recovery. Of the four choices on Wednesday's Twitter poll - Rocky, Lucky, Iron and Stan Lee - the Marvel Comics creator is at time of writing leading the pack. Mr Lee died earlier this week at the age of 95.